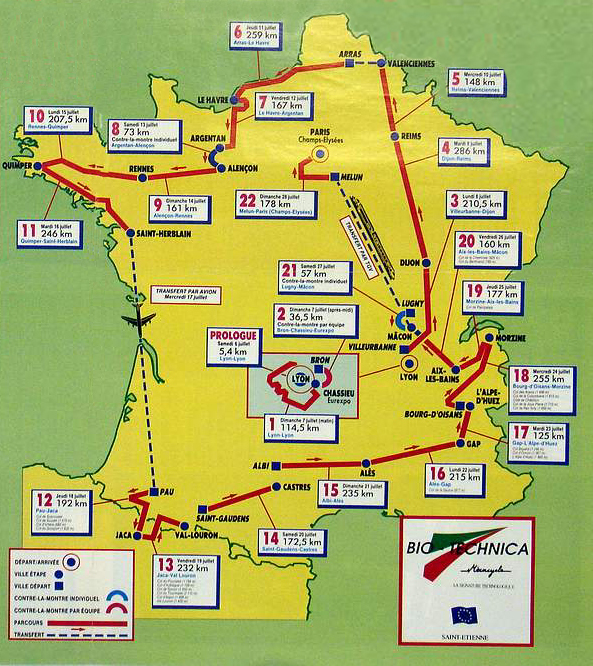 The 1991 Tour had 22 stages plus a prologue that totaled 3914.4 kilometers. It was ridden at an average speed of 38.747 km/hr. 198 riders started and there were 158 classified finishers. This was Miguel Indurain's first of five consecutive Tour victories. While wearing yellow Rolf Sorensen crashed near the end of stage 5, breaking his clavicle. He was forced to abandon. Thierry Marie won the following stage and the lead by executing the longest post-war solo break (234 km). Greg LeMond was expected to repeat his 1989 and 1990 Tour wins with a third consecutive victory. LeMond took the lead in the stage 8 time trial and looked capable of holding it all the way to Paris. In the final 500 meters of stage 13's ascent of the Tourmalet, LeMond couldn't stay with the leaders. That moment signalled the transition from the LeMond era to the near total hegemony of Miguel Indurain. Prologue: Sunday, July 6, Lyon 5.4 km Individual Time Trial. Stage and GC places and times are the same. Stage 1: Sunday, July 7, Lyon - Lyon, 114.5 km. 2. Jean-Paul Van Poppel s.t. 5. Etienne De Wilde s.t. 7. Etienne De Wilde s.t. 8. Gerrit De Vries s.t. 8. Etienne De Wilde s.t. 7. Etinne De Wilde s.t. This excerpt is from "The Story of the Tour de France", Volume 2 If you enjoy it we hope you will consider purchasing the book, either print or electronic. The Amazon link here will make either purchase easy. Of course, after his 1989 and 1990 Tour victories, LeMond was expected to be the man to beat in the 1991 edition. His spring was less auspicious than ever. He abandoned the Giro and finished twelfth in the Tour of Switzerland. But a less than sparkling spring was never a sign that LeMond should be counted out of the Tour de France. 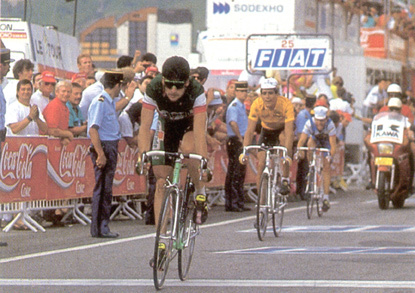 Thierry Marie started the 1991 Tour the same way he had the year before, by winning the Prologue time trial. The real racing started with the first stage. A break of serious Tour men got away: LeMond, Erik Breukink, Sean Kelly and Rolf Sorensen among them. With the time bonuses and his good prologue, LeMond was back in Yellow. This was a 2-stage day. The afternoon was a team time trial: Sorensen's Ariostea squad won the stage and put Sorensen in the lead. Sorensen kept the Yellow Jersey until stage 5. 4 kilometers from the finish of that stage Sorensen hit a traffic island and broke his clavicle. His Tour was over. Sorensen's Ariostea sqaud wins the team time trial. Prologue specialist Thierry Marie showed that he could do more than just a few kilometers at speed. He won the sixth stage with an astounding 234-kilometer solo break, the third-longest post-war escape by a single rider (Albert Bourlon's 253-kilometer ride in 1947 remains the postwar record). At the end of the stage the pack was breathing down his neck, but he had 1 minute, 54 seconds to spare. That was enough to put him back in Yellow for a couple of days. Stage 8's long 73-kilometer individual time trial brought out the real Tour riders. Miguel Indurain won the stage. That put LeMond back in Yellow. In the Overall, Breukink was 1 minute, 13 seconds back and Indurain was at 2 minutes, 17 seconds. A couple of days later, things got messy. Before the start of stage 10, 2 riders on the PDM team quit the Tour. Along the road to Quimper where the stage finished, a couple of other PDMs retired. That evening it was revealed that several PDM riders including Erik Breukink, Sean Kelly and Raul Alcala were very ill. Only the riders and none of the support staff of the team were sick, which ruled out food poisoning. Eventually Jonathan Boyer, spokesman for the team, said that it might have been a bad glucose drip (perfectly legal) that infected the riders. The team withdrew from the Tour amid speculation that a doping program gone wrong was involved. Nothing was ever proven to that effect and the PDM team always denied using banned substances. The real action of the Tour began with the first Pyrenean stage, from Pau to Jaca with 2 category 1 climbs. A break got away on the first climb, the Soudet. By the second climb, the second category Ichère, the break was established and contained 3 riders of real class: Luc Leblanc, Pascal Richard and Charly Mottet. LeMond was unable to either get up to the break or enlist help from the other teams. By the end of the day, with a winning margin of almost 7 minutes over the LeMond group, Leblanc had gained the lead with LeMond 2 minutes, 35 seconds down. It was the next stage, unlucky (for LeMond) number 13 that changed the face of the Tour and set the tone for the next 4 years as well. It was a 232-kilometer stage that crossed the Pourtalet (category 1), the Aubisque (hors category), the Tourmalet (hors category), the Aspin (category 2) and the final ascent to Val Louron (category 1). Only the well-prepared and truly competitive would survive the stage with their high classifications intact. It was on the Tourmalet that fortunes were reversed. LeMond broke away near the bottom of the mountain. Indurain chased, bringing with him Leblanc, Hampsten, Chiappucci, Gianni Bugno, Charly Mottet and Gérard Rué. Near the top, with just 500 meters to go, LeMond slid off the back. He could do nothing as he watched the others slowly distance themselves from him. At the top of the Tourmalet LeMond, as he fought with every ounce of energy he could command to keep them in sight, was only 17 seconds behind the leading group. Never one to give up, LeMond descended with that terrific ability that had saved him so many times before. He rejoined the leaders, but Indurain had taken off. 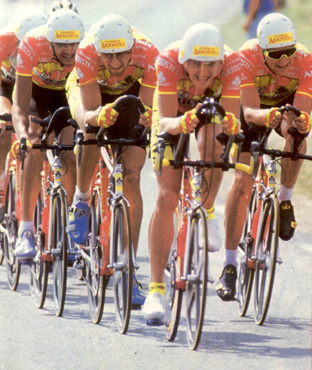 In a giant gear, LeMond bolted from the leading group, fully understanding the importance of what was happening. This was the Tour's pivotal moment. At the foot of the Aspin, he could see Indurain. Once the climbing began anew, LeMond lost ground again, unable to keep pace with the soaring Spaniard. Meanwhile, Claudio Chiappucci had extracted himself from the leaders and was chasing Indurain. Getting word from his director that the Italian was on his way, Indurain slowed to allow Chiappucci to join him. The 2 then relayed each other to the finish with Chiappucci taking the stage and Indurain taking the overall lead. LeMond finished 7 minutes, 18 seconds later. The Yellow Jersey, Luc Leblanc, fared worse. As LeMond fought to get back on terms with Indurain and Chiappucci, Leblanc was jettisoned from the chasers. He came in sixteenth, 12 minutes, 36 seconds after Chiappucci. Moreno Argentin wins stage 15 into Alès with a 1 minute gap on his chasers. Stage 16 showed that LeMond had absolutely no intention of giving up. He had been down this much time before and had managed to win the Tour. On a day with no highly rated climbs, he fought to get into breaks and when caught, went again. He got second in the stage and pulled back 26 seconds. This was a hard but successful day's work. There was no avoiding the fate that awaited him the next day with its finish at the top of L'Alpe d'Huez after the Bayard and Ornon, both second category climbs. Gianni Bugno took the stage with Indurain right on his wheel. Chiappucci and Rooks were 43 seconds back. LeMond, Theunisse and Hampsten were about 2 minutes behind. Stage 17 atop L'Alpe d'Huez: Bugno wins with Indurain (in Yellow) and Leblanc following. The final Alpine stage was the cruelest of all, 255 kilometers covering the Aravis, the Colombière (both first category) and then the Joux-Plane (hors category). 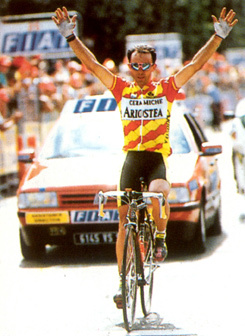 Thierry Claveyrolat won the stage with most of the contenders, including Indurain, about 30 seconds behind. LeMond was fifty-ninth at 7 minutes, 52 seconds, accompanied to the finish by his teammate Robert Millar. LeMond broke away again on stage 17 and snatched back a minute and a half. Because LeMond was no longer a threat to Indurain, Indurain was content to finish in the middle of the pack. The twenty-first and penultimate stage was a 57-kilometer time trial. Indurain won it, Bugno was second and LeMond was third. The Tour was sealed. On the final day with the criterium up and down the Champs Elysées Djamolidine Abdoujaparov, nicknamed the "Tashkent Express", was involved in a spectacular crash. With less than a kilometer to go, Abdoujaparov, the wearer of the Green Jersey, ran into a barrier and went flying. It took a quarter of an hour before he could get up and cross the line. Because it was in the last kilometer, Tour rules mandated that he get the same time as the pack and he was allowed to keep his Green Jersey. Miguel Indurain raced with the economical style of Jacques Anquetil. He did nothing more than necessary in the mountains. Only if an obvious or extraordinary opportunity presented itself did he attack. He was content to let his time trialing and watchful riding do the rest. It makes for a less exciting job for this chronicler of the Tour, especially after the tumultuous years of Hinault, Fignon, Delgado and LeMond. A look at the final General Classification shows a real generational shift. Delgado, LeMond and Fignon, who had been so dominant, were now well down in time while younger riders surfaced. A sad coda to this and the previous Tour should be mentioned. In 2004, in an interview in the French newspaper Le Monde, Greg LeMond said, "In 1990 I won the Tour and my team [Z] won the top-team classification. One year later, not one of us could follow the pace in the pack. There had been a radical change." He went on to note that when he was winning, his VO2 Maxmaximum oxygen consumption, the basic measurement of an athlete's aerobic capacitywas tops among professional racers. Today, LeMond said, he would be in the fifty-first percentile. In other words, the Greg LeMond of 1990 who won the Tour de France would be sent back for water bottles today. Commenting on this interview in an open letter, Andy Hampsten wrote "Like Greg, I, too, saw what I believe were the effects of EPO when it entered pro cycling in the early '90s. In the first years it grew from a few individuals reaping obscene wins from exploiting its 'benefits', to entire teams relying on it, essentially forcing all but the most gifted racers to either use EPO to keep their place in cycling, quit, or become just another obscure rider in the group." These athletes spoke out honestly with a real concern for the direction of the sport. They received almost nothing but opprobrium for their trouble. Their words are the results of experience and have wisdom in them. Video of the final stage where Djamolidine Abdoujaparov crashed horribly.